This information has been prepared to assist teachers or coordinaters in planning for visits to the Legislative Assembly for the ACT, it is not intended to replace individual risk assessment processes. Responsibility for conducting risk assessments remains the responsibility of schools or organisations (the Assembly does not undertake individual assessments for visiting groups). Enquiries for arranging a visit should be directed towards to the Manager, Education and Engagement on (02) 62053016. The education team can provide advice and support in developing a suitable program to meet the specific needs of a particular group. special needs for any visitors. The Legislative Assembly for the ACT is located at 196 London Circuit adjacent to the Canberra Theatre. 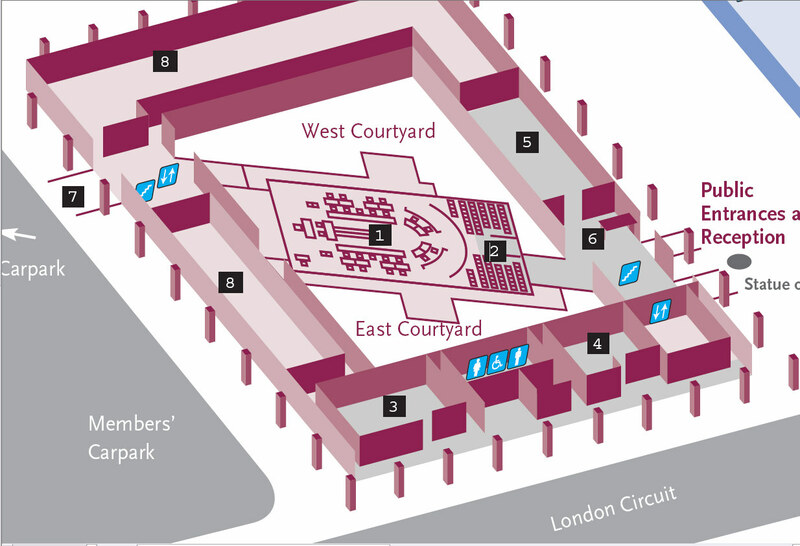 The diagram below shows the location of the Assembly building in relation to the theatre and London Circuit. It is common for school groups to be dropped off on the London Circuit side of the building either by public or chartered transport. Groups are usually dispatched on the Northbound side of the road which is immediately adjacent to the Assembly and due care should be given to ensure that students do not wander on to the road after alighting from buses. Teaching staff are responsible for ensuring the safety of students as they disembark from buses and for ensuring safe passage to and from the Assembly building. All visiting groups should make their way to the public entrance of the building which is located on Civic Square and present to the security attendants for processing. All visitors to the building, including visiting school groups, will be required to pass through the Assembly’s security processing station. Security processing will involve metal detection scanning and inspection of bags. Because the building has only a limited space available to store visitors’ bags and to speed up processing times for school groups, students are asked not to bring bags with them on visits to the Assembly. Potentially threatening items such as knives, metal scissors, cricket bats and box-cutters cannot be taken into the building as such items are not permitted under Legislative Assembly access control policies and procedures. Where security personnel detect a prohibited weapon (e.g. firearms, certain bladed weapons, tasers) during the screening process, it is the Assembly’s protective security policy and procedure that the Australian Federal Police will be called. Teachers should allow about 10 minutes for security processing for a school group of 30 students. CCTV cameras are installed throughout the Assembly building. The central point of contact for information on the Assembly’s security arrangements is the Principal Attendant who can be contacted on (02) 62050445. After passing through security processing, groups will be met by the Assembly’s Education and Engagement Officer and arrangements for the day will be discussed including a run down of the activities that will be undertaken throughout the visit. During the orientation, the Education and Engagement Officers will briefly run through the Assembly’s evacuation procedures. The Office of the Legislative Assembly has in place appropriate evacuation procedures dealing with a range of scenarios. Exit points are clearly sign-posted, evacuation instructions are listed near key entry and exit points, and evacuation alarms and an emergency intercom system can be deployed in the event of an emergency of some type. Two different types of alarms are deployed in the event of an emergency. The first alarm to be sounded in the event of an emergency is an alert tone (Beep! Beep! Beep!) which indicates that visitors should gather their belongings and prepare for evacuation. The second tone is the evacuation tone (whoop! whoop! whoop!) which indicates that visitors should, in an orderly fashion, leave the building via the nearest emergency exist. The evacuation point for emergencies is the Canberra Theatre steps in Civic Square. The Assembly has occupational health and safety arrangements in place to effectively manage the array of safety issues that impact on both staff and visitors to the building. Public toilets are located on the ground floor of the London Circuit side of the building as shown in the bottom part of the following diagram (blue female, male and wheelchair symbols). The Legislative Assembly has a number of staff with first aid qualifications available throughout the building. There is also a defibrillator which is located at the public entrance. For more information on first aid contact the Principal Attendant on (02) 62050445. Visitors with disabilities are able to move between the public areas of the ground floor and first floor via lift. Toilet facilities for people with disabilities are available on the ground floor of the London Circuit side of the building. Teachers are expected to ensure that students maintain appropriate standards of behaviour in the public gallery and throughout the building generally. Students should be adequately supervised by teachers at all times. Students should be reminded that the use of mobile phones, speaking loudly and other disruptive behaviour is prohibited in the public gallery. Photography within the Assembly building is not permitted without the prior approval of the Speaker. From time to time, refreshments will be provided to visitors as part of a program. It should be noted that because food is prepared offsite, the Assembly does not guarantee that any of the food provided will meet the needs of people with food allergies such as celiac or those with peanut allergies. It is therefore advisable for visitors to make their own arrangements for anyone with particular food allergies to ensure their safety. Education and Engagement Officers have been registered pursuant to the Working with Vulnerable People (Background Checking) Act 2011. The Assembly is covered by appropriate public liability insurance and school groups visiting the Assembly to participate in its education programs are covered under this policy.